The historic marker at the side of the road. 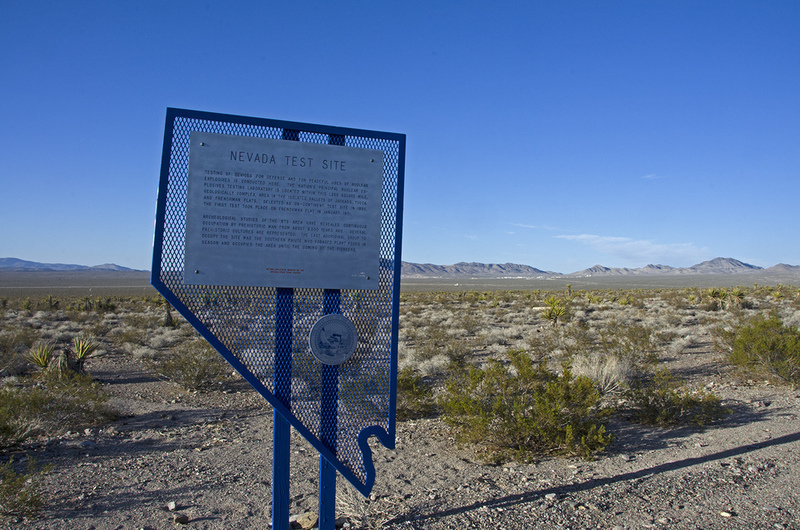 I was in Nevada, driving south on I-95, probably about an hour north of Las Vegas, when I passed one of those big Nevada State Historic Signs. I caught the words “test site” as I was speeding by and when I realized what it was referring to, I headed back to get a closer look. “Testing of weapons for defense and for peaceful uses of nuclear explosives is conducted here. The nation’s principal nuclear explosives testing laboratory is located within this 1,350-square-mile, geologically complex area in the isolated valleys of Jackass, Yucca and Frenchman Flats. Selected as on-continent test site in 1950, the first test took place on Frenchman Flat in January, 1951. The turnout is as close to the test site area as the public can get, so pull off and take a picture. I wouldn't be surprised to learn that while you’re there reading the sign, someone is watching you on surveillance equipment. Smile at the camera! The "town" of Mercury off in the distance.